Acuvue Oasys for Astigmatism Contact Lenses are fortnightly disposable contact lens made for people who require a toric contact lens or need correction for astigmatism. 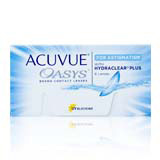 Acuvue Oasys for Astigmatism Contact Lenses contain Hydraclear Plus technology, a special wetting agent which keeps the surface of the lens moist and silky smooth. Experience contact lens wear the way it was intended to with Acuvue Oasys for Astigmatism and enjoy have stable, clear vision all day. Acuvue Oasys for Astigmatism Contact Lenses use a specialised design which keeps the lenses in place and stable, minimising intermittent blur you normally get with prism ballast designs.